Miami Springs is a city located in Miami-Dade County, Florida. The city was founded by Glenn Hammond Curtiss, "The Father of Naval Aviation", and James Bright, during the famous "land boom" of the 1920s and was originally named Country Club Estates. It, along with other cities in Miami-Dade County such as Coral Gables, Florida, and Opa-locka, Florida, formed some of the first planned communities in the state. Like its counterparts, the city had an intended theme which in its case, was to reflect a particular architecture and ambiance. Miami Springs is located at 25°49′11″N 80°17′28″W﻿ / ﻿25.819725°N 80.291071°W﻿ / 25.819725; -80.291071. According to the United States Census Bureau, the city has a total area of 3.0 square miles (7.8 km2). 2.9 square miles (7.5 km2) of it is land and 0.04 square miles (0.10 km2) of it (1.34%) is water. Roughly speaking the core of Miami Springs (excluding the more recently annexed areas) is roughly shaped as a triangle with three definable sides. Northwest 36th Street forms most of the southern boundary whilst the Miami River canal forms the northern/eastern boundary. Finally, the Ludlam Canal and Florida East Coast Railroad Yard delimit the western boundary. As of 2010, there were 5,361 households out of which 5.6% were vacant. In 2000, 33.6% had children under the age of 18 living with them, 52.0% were married couples living together, 12.2% had a female householder with no husband present, and 30.9% were non-families. 24.8% of all households were made up of individuals and 8.2% had someone living alone who was 65 years of age or older. The average household size was 2.64 and the average family size was 3.16. In 2000, the city population was spread out with 22.9% under the age of 18, 7.2% from 18 to 24, 31.2% from 25 to 44, 23.2% from 45 to 64, and 15.5% who were 65 years of age or older. The median age was 39 years. For every 100 females, there were 92.5 males. For every 100 females age 18 and over, there were 88.6 males. In 2000, the median income for a household in the city was $50,000, and the median income for a family was $56,892. Males had a median income of $37,176 versus $30,823 for females. The per capita income for the city was $22,963. About 6.9% of families and 9.7% of the population were below the poverty line, including 9.8% of those under age 18 and 8.6% of those age 65 or over. As of 2000, speakers of Spanish as a first language made up 63.21% of residents, while English accounted for 35.49% of the population. Other languages spoken as a mother tongue were well below 1.00%. 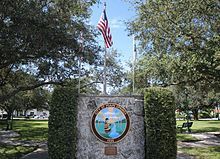 As of 2000, Miami Springs had the sixteenth highest percentage of Cuban residents in the US, with 31.83% of the populace. It had the thirty-third highest percentage of Colombian residents in the US, at 3.89% of the city's population, and the twenty-second highest percentage of Nicaraguan residents in the US, at 2.06% of the population. It also had the twenty-sixth most Peruvians in the US, at 1.90%, while it had the nineteenth highest percentage of Venezuelans, at 1.01% of all residents. Miami Springs was founded by an aviation pioneer, and thus, the fate of the city has always been intertwined with the aviation industry, particularly since Miami International Airport (MIA) is located just south of the city on the southern border of NW 36th Street. The airline industry brought many residents from airline crew bases, as well as employment opportunities at the airport, which brought much prosperity to the city. This dependence, however, left the city vulnerable. The sudden 1991 collapses of both Eastern Airlines and Pan American World Airways left many Miami Springs residents unemployed and unable to afford living in the neighborhood. Given that the businesses in Miami Springs had always relied upon the large disposable incomes of the employees of the large airline carriers, the bankruptcy of both corporations in the same year created a chain reaction, eventually causing many small businesses to close their doors. Despite the closure of the airlines, from a residential standpoint, Miami Springs remained strong. The city is often seen as blessedly isolated from the perceived turbulence of the rest of Miami-Dade County. This has continued to provide ample replacements for the older residents who are lost over time. Nonetheless the legacy of the airline closures remains. Residential millage taxation rates hover near the state mandated maximum because continued weakness in the commercial sector makes it an insufficient source of tax revenue. The Consulate-General of Bolivia in Miami is located in Suite 505 at 700 South Royal Poinciana Boulevard in Miami Springs. 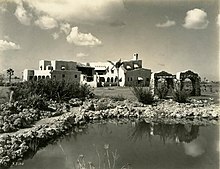 Curtiss Mansion is a Pueblo style home that belonged to city founder Glenn Curtiss. Beginning in the late 1970s, the house was subject to vandalism and a number of fires. In 1998, a public/private partnership of Curtiss Mansion, Inc., and the city of Miami Springs embarked on a lengthy restoration project, completed in 2012. Fair Haven Nursing Home is one of the oldest buildings in Miami Springs and is built in the pueblo style favored during the initial development. The building was designed by architect Bernard E. Muller. It was designated a Miami Springs Historic Site in 1984. Before becoming a nursing home, the building served as the Hotel Country Club. The hotel was built by Glenn Curtiss and partners, and was intended to promote the development of the then-new Country Club Estates. It was furnished in a Southwestern style, with Navajo rugs on the floor and handcrafted solid mahogany furniture. In 1929, after the crash, Curtiss sold the hotel to his friend John Harvey Kellogg, who renamed it the Miami Battle Creek Sanitarium and operated for many years. During World War II, it served the Air Transport Command as a hospital for recuperating military personnel. Later it became a home for the elderly, which it still is today. Glenn Curtiss Elementary AIE Charter School (Academy for International Education) provides K-8 education. ISAAC Academy (Integrated Science and Asian Culture) provides K-8 education. ^ "MLA Data Center Results of Miami Springs, FL". Modern Language Association. Retrieved 2007-10-31. ^ "Ancestry Map of Cuban Communities". Epodunk.com. Retrieved 2007-10-31. ^ "Ancestry Map of Colombian Communities". Epodunk.com. Retrieved 2007-10-31. ^ "Ancestry Map of Nicaraguan Communities". Epodunk.com. Retrieved 2007-10-31. ^ "Ancestry Map of Peruvian Communities". Epodunk.com. Retrieved 2007-10-31. ^ "Ancestry Map of Venezuelan Communities". Epodunk.com. Retrieved 2007-10-31. ^ "Servicios Consulares Archived 2009-02-19 at the Wayback Machine." Embassy of Bolivia in the United States. Retrieved on January 30, 2009. ^ Daley, Bill (March 29, 2012). "Curtiss Mansion ready for public". Miami Herald. Retrieved 2012-04-03. This page was last edited on 15 March 2019, at 23:27 (UTC).